← Light up: Picking a good headlamp. NEWAYGO, MI — Hot summer days aren’t always the best for trout, but summer is dynamite for smallmouth bass. And fortunately, Michigan has a number of great rivers for smallies. What’s special about smallmouth is they are feisty fish. They put up a good fight. But, even better is that they are readily caught using flies. Take a big one on a fly rod, and you have a handful. A friend and I recently hit the Muskegon River looking for smallmouth. It was one of those brutal, 90-plus degree days, the kind where sweat drips off your brow. 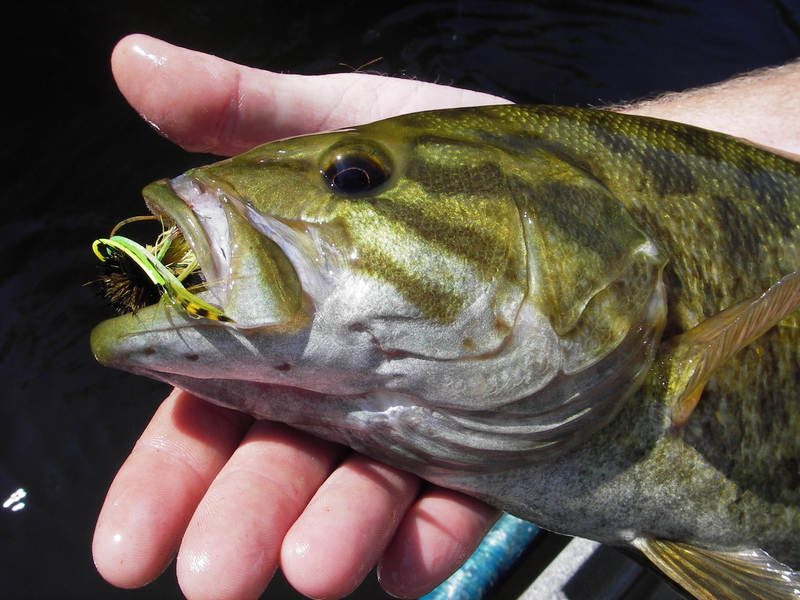 But that didn’t keep the smallies from feeding on the surface and nailing our flies all day long. You can catch smallmouth on waters up and down the Muskegon River. Local guides are reporting good results from Pine Street downstream, but we opted on this day to concentrate on one of lower segments downstream from Newaygo. The river there is mild-tempered, and there is plenty of structure along the banks. Downed trees, rocks and log jams all made perfect cover. We started with the usual assortment of wild-looking poppers, casting to the banks and the fishy places near shore. He’d row and I’d cast, or I’d row and he would cast. The action was steady and, at times, really good, with rod-bending 16-inchers coming to the net. Poppers seemed like a good idea. They push a lot of water and make a commotion. The strip, strip, pause, retrieve pattern often will incite a strike. But they weren’t producing as expected on this day. We took a few, not a lot. So we shifted to tried-and-true crayfish patterns, hoping to entice them with another favorite food. count after nearly two dozen fish — largely came from an assortment of streamers that imitated bait fish. “There’s a good one,” my friend said mid-afternoon. His rod once again was deeply arched toward the stream. Once again, he landed a nice 16-inch smallmouth. His fish was nowhere near the 9.25-pound Michigan state record set in 1906. That fish was caught on Long Lake in Cheboygan County. It was 27.27 inches long. Long Lake has produced a number of state Master Angler-sized smallmouth bass over the years, but nothing that compares. They are more likely to be 21 or 22 inches long, five pounds and bigger. You can find fish like that in a number of Michigan rivers. If you take a look at the state’s Master Angler list over the past decade, you’ll see many have produced qualifying entries. The Muskegon River produced a 25-incher. The Grand River in Kent County produced a 24.88 inch smallmouth. The Grand is well-known for its smallmouth fishing, as is the Flat River, which produced a 22.38-inch Master Angler smallmouth. The Thornapple River is another. It produced a 22-incher, as did the Pentwater River. Even the Boardman and Chippewa Rivers have 21.25-inch Master Angler smallmouth entries. The St Joseph River is another favorite that produced a 19-inch smallmouth. On the east side, there are several more like the Rifle River (22.5 inches), the St. Clair River (24 inches), the east branch of the Tittibawassee (21.5 inches) and Shiawassee River, which produced a 24.5-inch smallie. 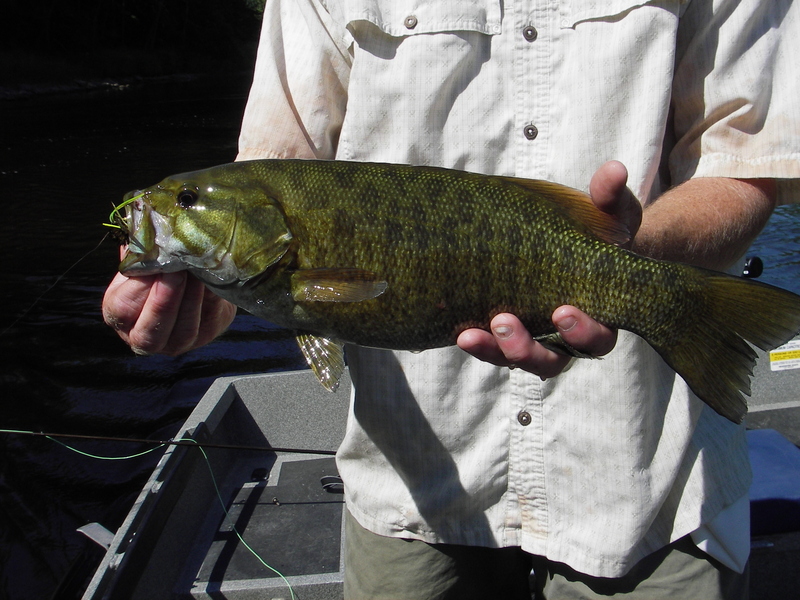 What surprised me was to find the lower AuSable River produces monster smallmouth. The AuSable, from Mio downstream, proves excellent water that also is good for fly fishing. The river produced a 24-inch Master Angler fish, weighing more than 5 pounds. And I recently saw a small video by fly fishing filmmaker Robert Thompson, who documented a much larger catch on a fly at night. Hot summer days might not be great for trout, but if you enjoy fishing streams, whether with spinning gear or flies, August should prove to be a great time to fish for smallies. 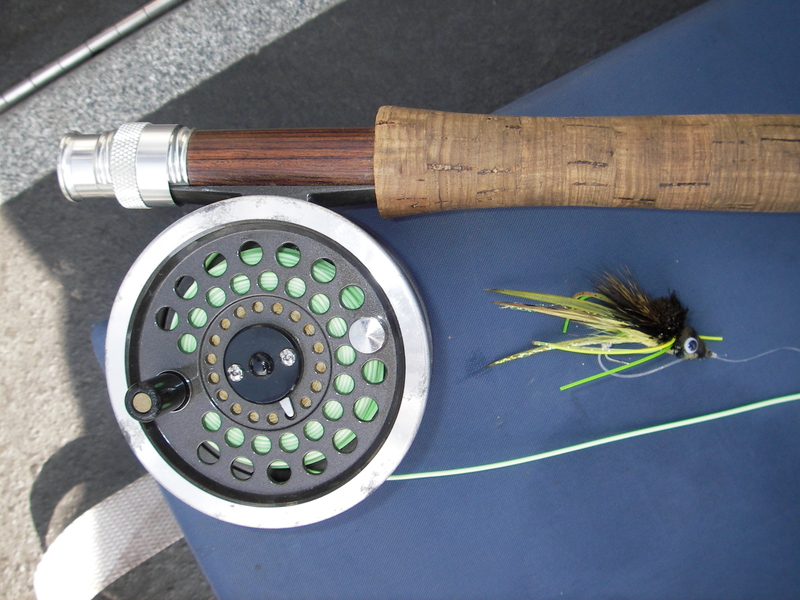 This entry was posted in Uncategorized and tagged Fishing, Fly Fishing, Muskegon River, Rivers, Smallmouth Bass. Bookmark the permalink.